Who doesn’t love discounts, right? Infact, 50% of all queries sent to us via Live Chat are asking if any discounts available. Since we work in an incredibly competitive & cut throat age of pricing, we can’t always offer discounts on demand. So we got to thinking, how we can add value for our customers. One of our team members came up with a kickass idea & this is what we are going to talk about below. But first, some perspective. Cash on Delivery is still prevalent in Pakistan & will continue to do so atleast for the next 5 years. But in the last 2 years, we have seen a general trend in which 1st time customers tend to opt for Cash On Delivery & on their next orders, most of them prefer to Pre Pay rather than Opt for Cash on Delivery. Opting for Pre Payments has 2 fold advantages. For us, we are assured that the order won’t be given the dreaded “REFUSED TO ACCEPT” status. For the customer, it diminishes the hassle of arranging cash right at the moment of delivery. The trust factor has already been developed since the completion of the 1st sale. Like any other company, our main priority is to be able to manage smooth cash flows. This allows us to pay back vendors, get more stock, pay salaries, pay expenses etc. Previously, we have depended on the courier companies but we’ve some got really bad experiences which led us to pay our vendors extremely late which created a lot of mess. The pre payment factor gives us advantage in smoothing out our cash flows. Where is the Discount ? This is the reason why you’re here so here’s where the discount is. Right at the Last Step of Checkout, where you select your Payment Options. 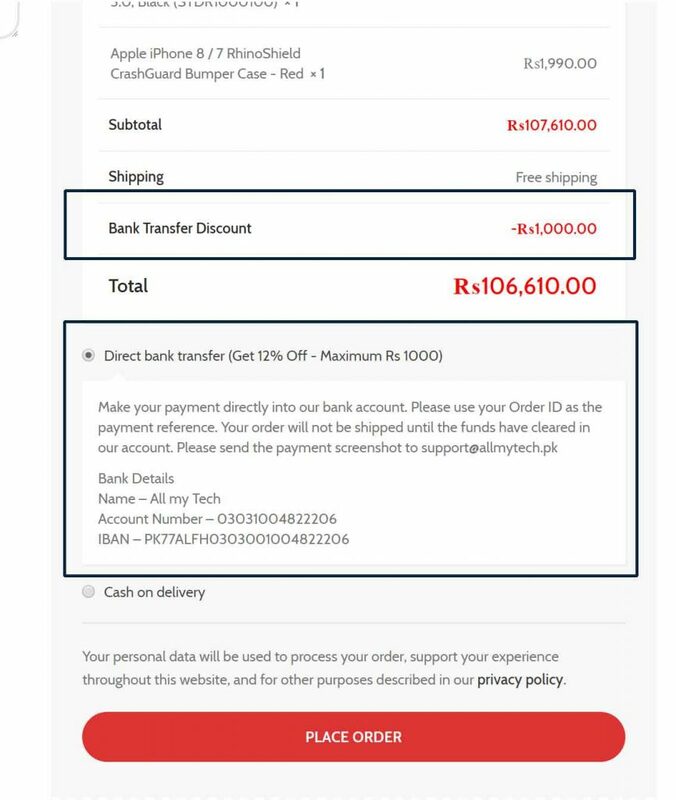 The Bank Transfer Option shows 12% Discount with Maximum upper limit of Rs 1000, this discount will be added in your cart instantaneously so you don’t have to wait for any coupons or anything of that sort. Just Checkout, Use Bank Transfer & enjoy some really wholesale discounts. Yes other Pre Payment Options are being tested as we speak & pretty soon you’ll be enjoying similar discount on Credit Cards / Digital Wallets as well. We plan to make this deal a permanent feature on allmytech.pk, it will depend mostly on the response from our customers side. If you continue to use this more & more we will add more flexibility in this deal. While you’re here, do checkout our bestsellers, they’re selling like Hot Cakes, take your pick.